Keratosis Pilaris is a common skin condition that looks like small goose bumps, which are actually dead skin cells that build up around the hair follicle. Keratosis pilaris is a disorder that occurs around the hair follicles of the upper arms, thighs, and sometimes the buttocks. It presents as small, benign bumps or papules that are actually waxy build-ups of keratin. Normally skin sloughs off. However, around the hair follicle where the papules form, the keratinized skin cells slough off at a slower rate, clogging the follicles. This is generally thought to be a genetic disorder, although the symptoms of keratosis pilaris are often seen with ichthyosis and allergic dermatitis. It can also be observed in people of all ages who have either inherited it, have a vitamin A deficiency or have dry skin. Keratosis pilaris is a self-limiting disorder that disappears as the person ages. It can become more severe when conditions are dry such as during the winter months or in dry climates. Yes, I have them but it's not fatal nor contagious...I had them 2 years back and still now. :( What I noticed is that whenever it's cold season, they appear and kinda itchy at times too. 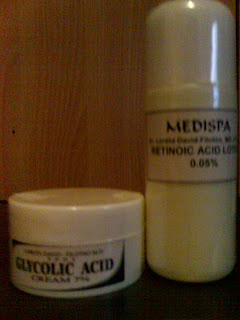 Thanks to my dermatologist Dr. Loreta David-Filoteo of MEDISPA. She gave me two creams to put on, 7% Glycolic cream to apply every morning and 0.05% Retinoi Acid lotion to put on before bedtime. She said it will make my "rashes" dissapear in amonth or two. Yeah, yeah i know it's a very slow process but at least diba it will make my skin smooth again.